For some folks, the perfect holiday requires nothing more than a good book, a cold drink, and a patch of sandy beach. For more adventurous types, however, that kind of relaxation is just plain boring. They require a little more stimulation, physical exertion, and some time in the great outdoors. Horseback riding holidays are increasing in popularity, drawing experienced riders and novices alike. Vacation planners can help to tailor a riding getaway that's just right for you, whether you are travelling solo or with a group of family and friends. If you are a true beginner, but the idea of galloping into your next holiday appeals to you, take a little time to familiarize yourself with the basics of horseback riding before you book your trip. Many areas, even those that are highly populated, have riding stables that offer quick courses for beginning riders. Before you commit to spending a week with a horse as your sole means of transportation, you might want to be sure that the reality of riding a horse lives up to the appeal of watching someone ride one in the movies! Reputable stables will be sure that you are properly equipped for safety; a fall from a horse can cause serious injury without proper protection, so always wear a helmet, preferably one designed for equestrian use. Be sure that the saddle is comfortable for you and that the stirrups are properly adjusted; when you hang your legs loosely, the bottom of the stirrup should be at your ankles. You do not have to invest in special clothing (although there is some really attractive equestrian wear available! ), but be sure that you are properly attired. Long pants are preferable to shorts, especially if you will be riding through any brushy areas, and be sure to have solid footwear. This is not the time to show off those great new sandals! Horses are beautiful animals and a good deal of that beauty is due to their strong, muscular stature. That same strength, however, can pose possible dangers if the horse gets frightened and decides to bolt. Most horses rented to tourists at horseback riding stables and holiday destinations are very calm and docile, but all horses are sensitive to sudden loud noises, so you must be prepared for that possibility. If you are riding an unfamiliar horse, it's a good idea to ask a stable hand about the horse's personality. For beginners, you might want to choose a horse named "Old Betsy" rather than selecting "Thunder Fire"! Check with the innkeeper about their policies on injury or illness. Most destinations do not assume liability for any injury that you might incur, and you will likely be required to sign a waiver. Although most riding holidays are pure pleasure, on any vacation, there is always the possibility of injury. One of the biggest advantages of a horseback riding holiday is that by getting off the beaten path a bit, you can explore areas not normally enjoyed by tourists. Be aware, however, that that same isolation means that you will have less access to emergency assistance if needed. For extended rides in remote areas, be sure to pack a basic first aid kit and a working mobile phone. Depending on your comfort level and the regulations of your holiday resort, you may be riding without the assistance of a professional guide. In this case, you must be certain that you have packed maps of the area, preferably ones that show all marked trails and include information about where you can find access to fresh water and areas that are suitable for camping, if that is part of your plan. Horseback riding holiday destinations are available worldwide, so no matter where your heart yearns to go, it is likely that you can explore on horseback. The English countryside, New Zealand's South Pacific Beach, the mountains of Colorado, and Morocco's Arabian Trail all await you. You just need to choose a spot, pack your bags, and get ready for the ride of your life. Cross Country International Equestrian Vacations offer a wide variety of destinations worldwide. They even offer training sessions and themed vacation packages (i.e. "Ireland's Matchmaking Festival Ride" Maybe you'll find the love of your life!). Equitours caters mostly to riders with horseback riding experience, but they do have a small number of tours available for those with minimal skills. They stress that riding requires strength and stamina, and prefer that riders are physically fit and not overweight. Destinations are available worldwide. 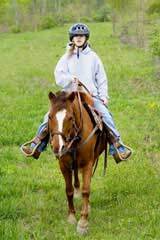 One particularly helpful source for finding the perfect horseback riding holiday destination is http://www.horse-riding.net, which offers a multitude of listings for locating horseback riding holiday destinations as well as independent stables worldwide available for lessons and day riding.